Is Your Child’s Learning Problem a Vision Problem? Home » What's New » Is Your Child’s Learning Problem a Vision Problem? At Miller Vision Specialties, we encourage all parents to bring their children for complete eye exams, beginning from infancy and throughout their years. 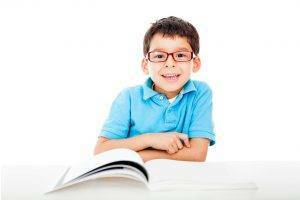 In addition to checking visual acuity, we’ll evaluate your child’s total visual system. While nearsightedness, farsightedness and astigmatism are all common pediatric eye problems, there are many more parts of vision that must be checked. We’ll also look at eye teaming, binocularity, eye mobility, accommodation skills (focusing) and eye-hand coordination. All of these visual skills can have a strong impact on your child’s ability to learn to read and write. Eyesight is linked closely to performance in the classroom, in social settings and on the sports field. A genuine learning disability originates from a problem in the brain, and vision correction will not help resolve the problem. In contrast, a vision-related learning problem can be corrected efficiently by eyeglasses, contact lenses and/or vision therapy. If your child is experiencing difficulty learning to read or copy text off the board, you should bring him or her to our Greensboro office for a comprehensive pediatric eye exam. This is the only way to diagnose or rule out your kid’s need for prescription eyewear or vision therapy. Vision therapy involves a series of sessions that run about 45 minutes each. It is not a do-it-yourself remedy, and neither does it offer an overnight cure. Yet after only a few short months of vision therapy in our office (approximately 12-24 weeks), kids generally notice substantial improvement. Our experienced vision therapists will use a variety of eye exercises and instruments, such as wands, swinging balls, computer programs, prisms and many more amazing, specialized tools! Altogether, these techniques work to develop and bolster areas of the brain that are directly responsible for controlling and coordinating the visual system. In addition to the work we do together with your child in our Greensboro clinic, homework exercises will also be assigned. Good cooperation between parents, kids and our team of optometrists goes far towards a successful outcome. Once your child is reading smoothly, able to see the board easily and/or excelling with aim and focus on the soccer field or tennis court, we’ll re-evaluate the need to continue with regular vision therapy sessions. When we all agree that vision therapy is no longer needed, we’ll instruct you and your child on a maintenance program of eye exercises. Follow-up exams will also be scheduled, so we can keep on top of any visual changes or symptoms that your child may experience. If regression occurs at any point in the future, supplementary visits to our vision therapist may be recommended. If your child is having trouble with basic skills, such as reading or writing, or suffers from a lack of coordination to follow the ball on the sports field, your first step should be to reserve an appointment with our expert eye doctors at Miller Vision Specialties. With years of experience in vision therapy, we look forward to evaluating and strengthening your kid’s visual system!